Sew easy projects « Super Mom – No Cape! I am so pleased with the results of last night’s Friday Night Sew In. 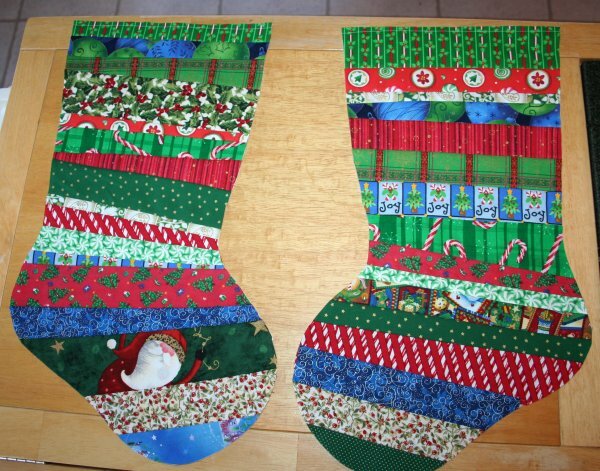 I was able to complete both Christmas stockings and on Monday they’ll be mailed off to Lyanna over at Purple Panda Quilts for her Stocking Drive to provide a handmade stocking to each of the foster children served by the agency she works for. After finishing the stockings, I even had time to cut out and baste the front of this Christmas pillow cover. When we were down in Panama City, I (of course) had to check out the local quilt shop, Quilting by the Bay. They had some of Laurel Burch’s new line, Holiday Celebrations. I missed out on buying Celestial Dreams when it was available and I didn’t want to miss out again so I decided I’d treat myself to just one panel. When Dave and I arrived back later in the day at our hosts’ place, I showed the lovely Lady L my little splurge. She mentioned that she’d love to have a Christmas pillow made out of that fabric. I plan on doing straight line quilting around the borders of each image. I’m hoping to have the pillow cover finished later today so that it can be mailed out on Monday as well. For now, I’m off to check out the blogs of the other participants to see what they worked on last night. 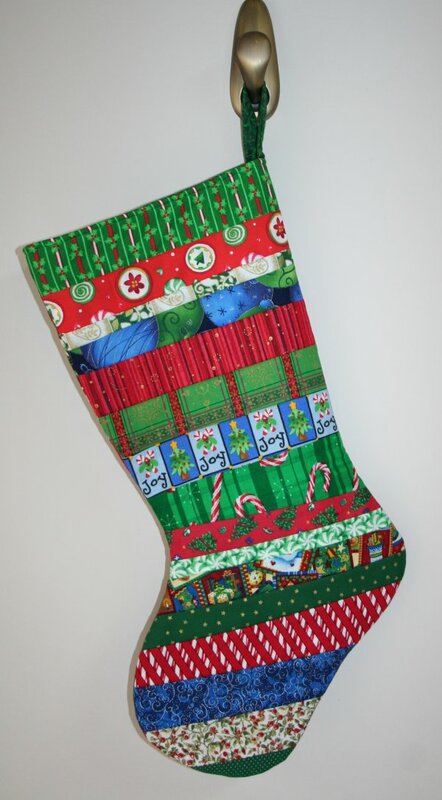 But before I go, I’d like to mention that starting November 28th, I’ll be holding a giveaway for the Christmas stocking pictured below as part of the 2011 Stocking Giveaway (button on my sidebar) being hosted by Robin at RSIslandscrafts. I’ve slowly been adding small gifts to the stocking; some handmade and some purchased. So be sure to come back and enter to win. The winner will be drawn on December 5th. I realize that at this busy time of year it might be difficult to remember to return to enter a giveaway at the end of the month. If you would like a reminder simply sign up to follow my blog via email. The sign-up box is in the upper corner of the left side bar. You’ll receive a notice each time I make a post. *Note: All stockings pictured measure 19 inches from top to toe and 11 inches at their widest. There has been a lot of secret sewing and embroidery happening here. But those will all have to remain a secret until after my parent’s 50th Wedding Anniversary, a certain December birthday and Christmas. What I can show you are the fabrics I’ve picked out to make a stocking for the Stocking Drive being held by Lyanna from Purple Panda Quilts. The fabrics folded at the top are going to be used to make the cuffs of the stockings. I stopped in to Hancock Fabrics on Monday to take advantage of their holiday 50% off sale on thread, zippers, lace and trim (with an additional 10% the entire purchase coupon) and those fat quarters were temptingly displayed in a basket on the cutting counter. Two of each print made their way into my shopping basket. 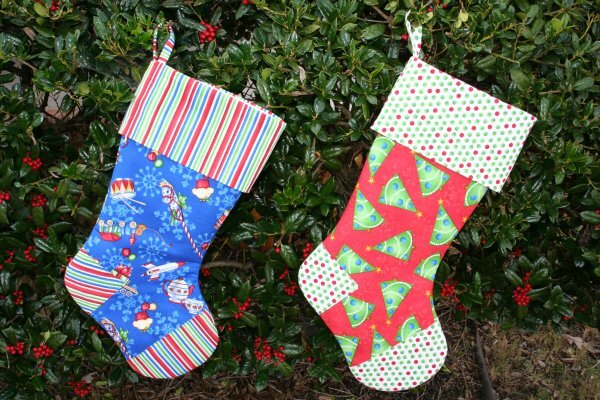 Fabric stockings, especially ones made with Christmas novelty prints, are so quick and easy to sew. I plan to make at least one for Lyanna’s Stocking Drive and another one or two to have to hand; ready to send off if I come across other such donations opportunities between now and Christmas. With the leftover fabric from those stockings along with some more from my stash, I also plan to make another QAYG (Quilt-As-You-Go) stocking like this one below that I made for the Stocking Giveaway I’ll be having at the end of November. I really liked how this stocking turned out and I think a QAYG stocking would be great to add to my box of ready to give gifts. The mini mystery giveaway that Robin held when she posted the sign up link is closed but you can still add your name to the list if you would like to hold a Stocking Giveaway on your blog at the end of November. This post has been added to WIP Wednesday #47 over at Freshly Pieced. Last week, Robin over at RSIslandcrafts posted her sign-up post for this year’s Stocking Giveaway. The sign-ups are for any blog that wants to host a giveaway for a Christmas Stocking on their blog at the end of November. Stockings for the giveaway can be handmade or bought. You can fill them or not. The next few months are going to be super busy, so I’ve been holding off signing up to host a Stocking Giveaway because I wanted to be sure I at least had the stocking part figured out. I knew that I wanted to give away a handmade stocking but there are just so many different patterns and designs to choose from when it comes to stockings. I also knew that I wanted to use what I had on hand to make the stocking. Yesterday, I had one of those wake up in the middle of the night and can’t go back to sleep times, so I got up and started working on some Christmas projects. I find embroidering to be almost a zen type experience and often when I get into the flow, inspiration will strike. This is the result of that inspiration and a couple of hours sewing yesterday and this morning. I’ve still got to sew the two pieces together, make the lining, etc. but I’m super pleased with the QAYG (quilt as you go) that I did for the front and back of the stocking. If you’d like to host a Stocking Giveaway on your blog in November be sure to sign-up over on Robin’s blog. She’s making it extra fun by having mini giveaways between now and November for those blogs that are participating. Now for those of you who don’t have a blog or don’t want to host a giveaway, you can still join in the fun come the end of November by visiting the blogs that are hosting giveaways and entering to win. The winners will be announced tomorrow afternoon, Sunday September 11th. 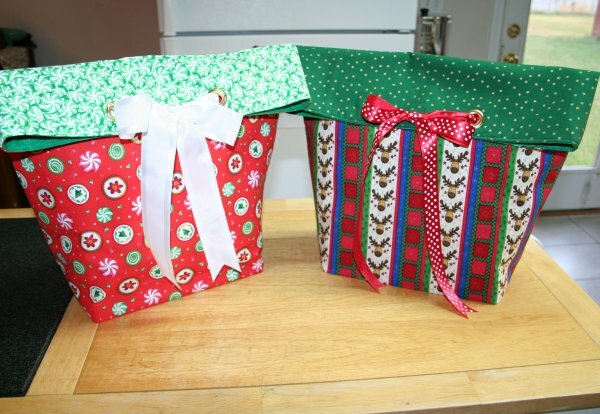 Just a quick reminder that today is the final day to enter the giveaway to win one of these handmade gift bags. 2. I don’t do facebook or twitter and I only want you to subscribe to my blog if you choose to but if you’d like an extra entry, blog about the giveaway and come back and leave a second comment on that post for a second entry. 3. The giveaway is open to anyone, anywhere in the world. The giveaway will close at 11 pm Eastern DayLight Time tonight, (September 10th) at which time I will draw two names from all the comments on the above mentioned post and send one of the gift bags to each winner. And of course, since it’s no fun giving away a gift bag without a gift inside, I will be slipping some surprizes into each bag, as well. So far, I’ve added two fat quarters to each bag and I’ll be adding a few more small surprizes as well. 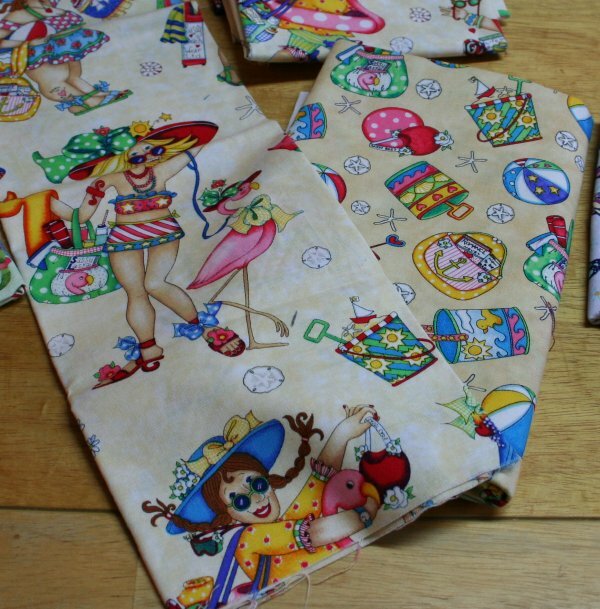 A fat quarter of the Beach Divas fabric and the co-ordinating Beach Toys fabric has been added to the gift bags. Bright and early Friday morning we checked out of our hotel. A quick stop at Canadian Tire for flashlight batteries (the one thing we kept forgetting in all our trips to various stores) and then it was time to drop our son off at his new home. Goodbyes were said. A few tears (mine) were shed, a final long hug and I was on the road home to Dave in Georgia. Our son’s landlady warned me not to leave so early because I’d just end up stuck in rush hour traffic but I know from experience that prolonged goodbyes just make them that much harder. Traffic, however, was unusually light on Friday. I think perhaps half the population of the GTA (Greater Toronto Area) must have taken an extra day off for the Labour Day weekend because once I hit the express lanes, it was smooth 100 km/hr driving all the way to the border. Along the way, I did make a quick stop to pick up Timbits for Dave and let me tell you, those were hard to resist on the trip home… but they stayed in the cooler the whole way. I didn’t even have one. How’s that for resisting temptation… lol. The little tourist center outside Niagara where I stopped had the wait times of the various border crossings listed. We usually cross on the Peace Bridge and I knew that being the start of the long weekend it would be busy but I was surprized to see that the wait time was already listed as an hour and a half. Wait time for the Rainbow Bridge however was listed as 15 minutes. Guess which one I decided to cross at. And I’m so glad I did. The I-190 from the Rainbow Bridge takes you right by the Peace Bridge and the traffic was backed up as far along the bridge as I could see. I had my stops all planned out. First up… the Calico Patch Quilt Shop. As I mentioned yesterday, there was something missing from the picture of my purchases. On my stop there on the way up, I was excited to find one of those new Lil Twister rulers that I’ve been reading so much about in blogland. Excited that is, until I had a chance to read the instructions which included a notation that there would be approximately 1/4 to 1/3 wastage. I don’t care how cute the resulting quilt is (and they are cute), that is more wastage than I’m willing to accept. The lady working that day wasn’t best pleased that I was returning it, but she did process the return which I quickly ended up spending on three more fat quarters. About 7 pm I called Dave, told him my location (as in what mile marker on the I-71 I was at) and that I was starting to feel like it was time to stop driving for the day. A few minutes later, he called back saying he had a hotel room in Mason, OH booked and which exit I needed to take. I was to call him back once I got to the hotel and he’d give me the reservation confirmation number. After a great night’s sleep and a good breakfast I was back on the road. 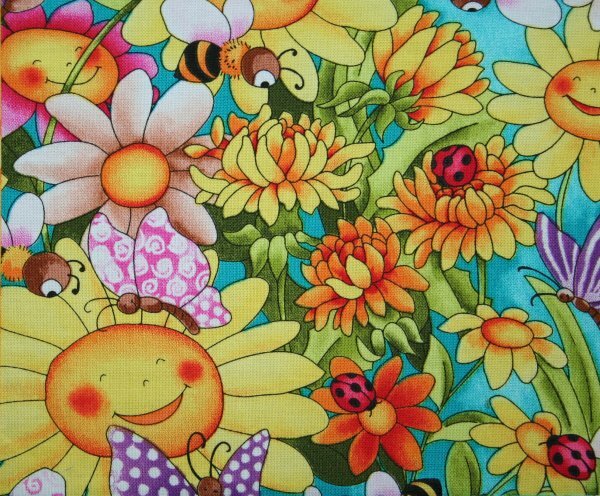 On the way up, I’d purchased that cute fat quarter bundle to add to my bug jar quilt fabric collection. 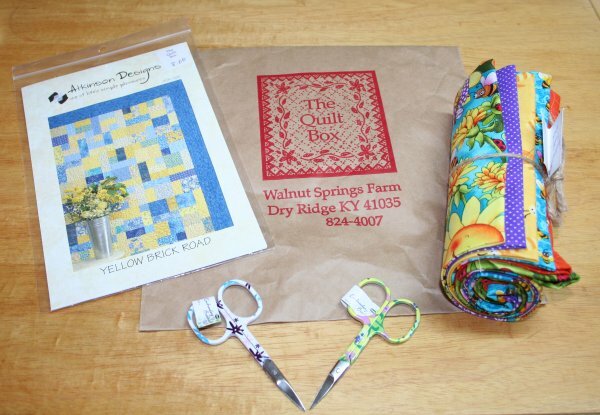 The ladies at The Quilt Box had actually put that bundle together to make a Yellow Brick Road quilt. And the more I thought about the sample quilt, the more I wanted to make one. So my first stop on Saturday was back at The Quilt Box for another bundle of those fat quarters and the pattern. By the middle of the afternoon, I was ready for another break. Mammaw’s Thimble Fabric and Quilt Shop is just off the I-40/1-75 and if you’re ever traveling through Knoxville, TN, I highly recommend that you stop by and check it out. This little shop, by far, has the largest selection of fabric in any of the quilt shops I’ve visited. If you like novelty prints, they’ve got lots in amongst the hundred and hundreds of bolts of fabric on display. If you find a fabric on the bolt that you like, but only need/want a fat quarter, chances are if you look in the cubbies right above you’ll find one in just that fabric. 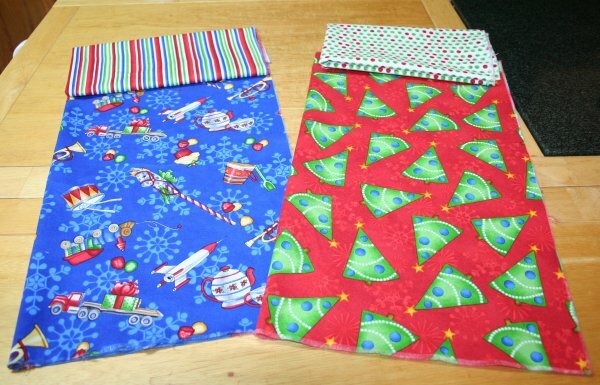 If you prefer buying quilt kits, they are displayed on racks and shelves throughout the shop. There were so many different ones, it was really hard to resist the urge to buy a couple. I had to keep reminding myself that I had added a quilt to my to-do list on this trip already. 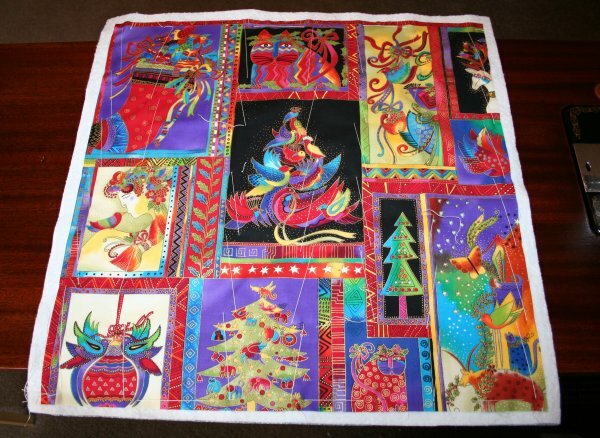 They also have a great selection of quilt patterns and the usual rulers and notions. There’s even a selection of Moda charm packs and jelly rolls. See that adorable “Beach Diva” fat quarter I’ve spread out for the photo. I picked up two to make a beach bag for myself but they are just so much fun that I picked out two more, plus a yard of the co-ordinating Beach Toys fabric. Half a yard of that is for me and the other half, I’ve cut into two fat quarters. 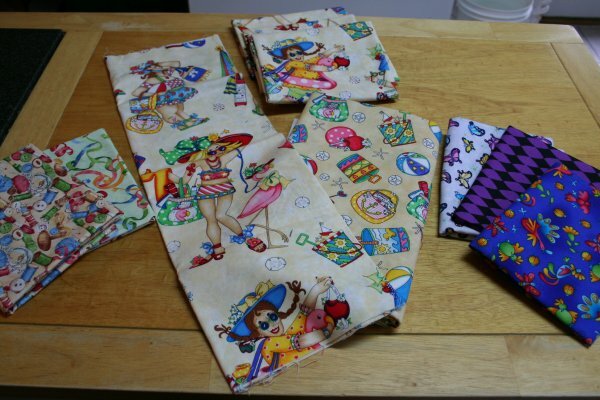 I’ve added a fat quarter of the Beach Diva fabric and the Beach Toys fabric to each of the gift bags that I’m giving away. Speaking of which, there’s still lots of time to enter the Gift Bag Giveaway by leaving a comment on this post. I’ll be drawing a winner September 10th. After that refreshing break, I was back on the road and by 7 pm was pulling into our garage. Home Sweet Home! Sunday, I spent just lazying around the house and enjoying the fact that I didn’t have anywhere I needed to go or anything that I needed to do. 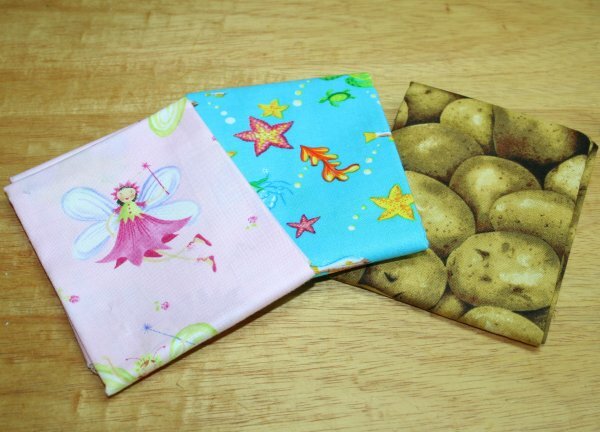 I did however get those two fat quarter bundles washed and Monday morning I started pressing, cutting and sewing. I just adore this fabric. It makes me smile every time I look at it. I did decide to “steal” a 6 ½” square from all the bug fabrics and so had to raid my stash of fat quarters plus cut into one I’d bought at Quilt a Bag in Canada to add back enough fabric so that those deletions and additions wouldn’t be glaringly noticeable. 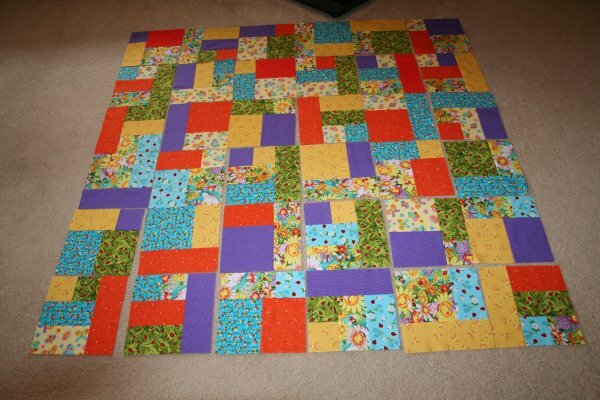 If you’re looking for a quick easy, strip pieced quilt, Yellow Brick Road is a great one to try. I really appreciate the time that the designer, Terry Atkinson of Atkinson Designs took to make sure that all the cuts maximized the use of the fat quarters. There was very little wastage. As of this morning, I have all the blocks sewn and now I’m trying to decide on the best layout. It’s proving to be a challenge. I’ll see a portion of the quilt with too much purple, so I rearrange squares only to discover a section with too much orange, so I rearrange those and so on. I will eventually decide enough is enough and start sewing blocks together. Then I’ll need to search my stash for border and binding fabric. I do have four blocks leftover. I would have had 5 left, but I changed the layout of 5 X 7 blocks that the pattern called for to a 6 X 6 block layout. I might add those blocks to the quilt back or perhaps make a matching pillow out of them. The pattern I used may be called Yellow Brick Road, but I’m calling mine Smiling Sunflowers. This post has been added to WIP Wednesday #43 over at Freshly Pieced.